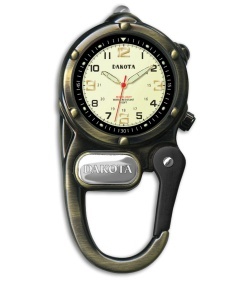 The Dakota Microlight is a watch to tote around everywhere you go with the carabiner clip. This watch has a bronze aluminum case, quartz movement. Also, included are luminous hands and hour markers, second hand, military time, stainless steel backing and ultra light LED. Packaged in a wooden storage/gift box. It can be clipped onto your belt, purse, backpack basically anything.